The skin becomes soft, cleansed and finds a comfort feeling. For adults with skin prone to redness, irritation and flaking of seborrhoeic zones. Gently cleanses, removes impurities thanks to the combined effectiveness of specific purifying actives and a patented complex associated with Uriage Thermal Water. In its composition has TLR2-Regul complex (anti-irritant and reliever), patented by Uriage Laboratories, that specifically acts on the irritations caused by the presence of microorganisms and is associated with the Piroctona Olamine, a recognised purifying active. Its foam is unctuous, very soft and easy to rinse. In the scalp: use it as shampoo 2 or 3 times a week. In the face and body: 1 to 2 times a day as a hygiene gesture. Foam on moist skin, leave for a few minutes and rinse. Avoid contact with the eyes. The Seborrheic Dermatitis is a chronic skin disorder, non contagious but recurring. The most common symptoms are redness, itching and discomfort. 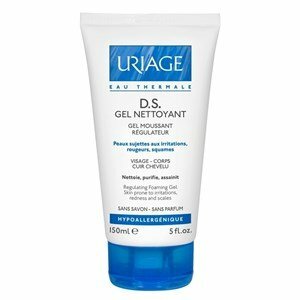 DS regulating cares, with the patented and exclusive complex TLR2-Regul, allow the skin (face, body and scalp) to calm down and recover all its comfort. Learn more about Cradle cap, advices and treatments. What are the causes? What are the characteristics? Sweetcare has all the informations that you need to know. Learn everything about the most comonn skin problems. What is the treatment, what are the symptones, how to prevent? Every information that you need for you have an amazing skin. News & Offers by Email? Opt out at any time by clicking Unsubscribe at the bottom of any of our emails.